Most of us tend to think of clutch bags for formal events. But if you really want to look chic think about ditching that big oversized handbag and adding a clutch or two to your wardrobe. The always stylish Duchess of Cambridge, Kate Middleton, always carries a stylish clutch. Now granted, she has minions for her other stuff, like a change of shoes, or someone to carry her reading material, but the look is classic. If don’t have minions, you can even throw in a sleek clutch into that big oversized handbag. Leave the oversized bag in the office and take your clutch to your next luncheon meeting in style. 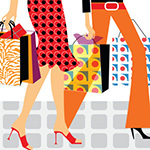 The wristlets make them easier to carry and, yes Tomatoes you can buy an oversized clutch too. Here are six clutch bags we’re loving. 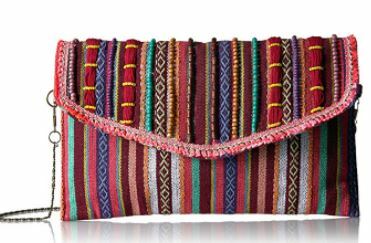 The Steve Madden Fabric Clutch. A cute day time clutch that’s a good size too, 6.5” high and 10.75” wide. It an insider zippered pocket and even comes with a shoulder drop. $63.58 Amazon. Hurry. 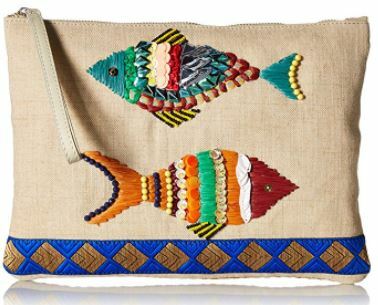 Grab this adorable Sam Edelman linen clutch before summer is over. Generously sized at 16.6 H x 14.4 wide, it was $98 but you can scoop it up for $68 at Amazon. 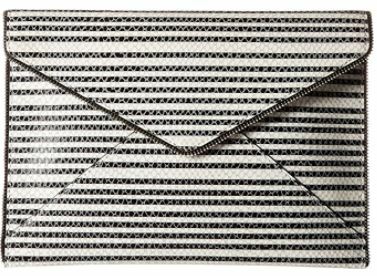 Rebecca Minkoff Striped Snake Leo Clutch. 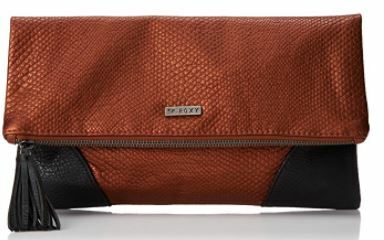 The envelope clutch made out of cowhide leather is perfect for fall. Size, 13 w x 8.9 H. $145 Amazon. 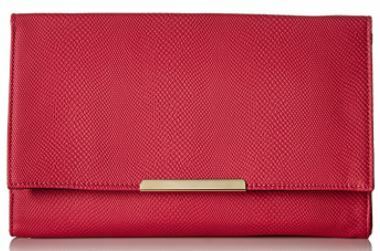 Jessica McClintock Envelope Clutch. Roomy enough (12.9’w and 7.6 inches) this clutch can take you from day to evening. Comes with a shoulder strap too. $42. Anazon. Brahmin Lily Pouch. 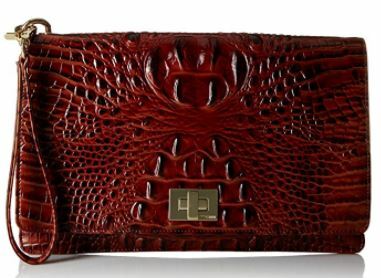 We love this leather embossed clutch that can be worn as a chic clutch with a removable wrist strap, or as an in bag organizer. It has a front pocket sized for larger smart phones and an interior zip pocket and key clip. $165 Amazon. Roxy Foldover Clutch. This mid size (11×11) foldover clutch holds the essentials and has a great tailored look. $39.50 Amazon.